GroVia Shell is a hybrid diaper cover that has snaps inside for the snap-in soaker pad sold separately. 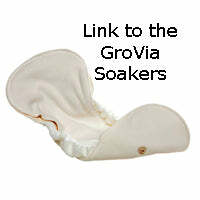 GroVia Shell is a hybrid diaper cover that has snaps inside for the snap-in soaker pad, sold separately. The Shell is designed to allow for multiple wears between washes and uses the industry's best materials. For use with GroVia Soaker Pads, GroVia BioSoakers, and other absorbent diapers. Does not have leg gussets. GroVia calls it a "shell" but the common word is "diaper cover" - they mean the same thing - the waterproof part that goes over something absorbent. The special thing about this is that it has snaps inside it. It is designed specifically for use with the GroVia Organic Cotton Soaker Pads or Stay Dry Soaker Pads, which are sold separately. You can use anything that fits in there that is absorbent (and ignore the interior snaps) such as a prefold. They are very trim fitting, so the small yellow edge prefold is usually the correct size inside this trim cover at the highest rise. Choose newborn orange edge for smaller rise settings. If you want trim, this is it. Of course, the trimmer it is, the smaller it is, which means it is not going to be as absorbent as a big and bulky diaper, but that is always the trade-off. The best use is of course with the soakers that are specifically designed for it. Organic Cotton Soaker Pads. The GroVia Soaker Pads in the GroVia Shells make a very trim, very easy to use system. Note from Karen: This is trim and it can be used over prefolds by ignoring the inner snaps that are there to attach the snap-in soakers. I find that the small yellow edge prefolds work nicely on the the highest rise setting. The medium prefolds are a bit too much for this trim cover in my opinion. Link to GroVia Shell Hook and Loop version. GroVia Shell is a hybrid diaper cover that has snaps inside for the snap-in soaker pads.